We needed to cut the grass. Just three weeks before, we’d used our push mowers and trimmed the green stuff to well under ankle height. Now, after the perfect combination (if you are grass) of steady rains alternating with bright and warm days, the undulating lawn was covered in knee-high weeds waving in the breeze and tall, shaggy patches of growth. They were also still wet from a recent downpour, and try as I might, I couldn’t get the manual mower to do anything but run over the tall stuff, bending and flattening it but doing far too little in the way of cutting it. Stepping back to consider my work, I appeared to have been trying to create crop circles to fool and excite the UFOlogists in the neighborhood. What was needed was a power mower. We could borrow one, or, if need be, rent one. But a power mower is something I will not, can not, use. It has nothing to do with the loud noise of it – although I do dislike the sound, especially up close – nor the smell of the clouds of exhaust. 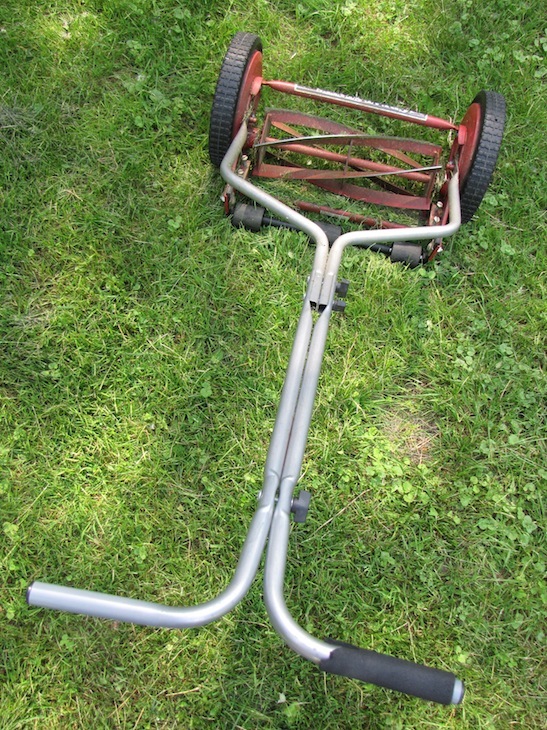 It has everything to do with this: When I was a kid, my Uncle Charles had a power mower – the electric kind, with a long extension cord that snaked back across his well-kempt lawn to an outlet inside his suburban ranch house. 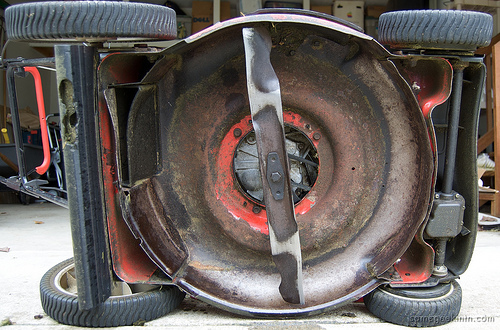 He was mowing one day – maybe a day like the one I was now trying to mow in – and, perhaps, the wet grass clumped up and choked the works, clogging the blades and bringing the mower to a halt. I don’t know the exact details – I don’t think I ever asked. I think I didn’t want to know, although now I do, a little. Anyway, for reasons I can never quite wrap my mind around, my Uncle Charles decided that he could remove that clump of grass, and he put his hand out and reached for the obstruction … and the mower started up. And he lost his fingers – all on that hand except for his thumb. Just like that. And family lore has it that when my Aunt Lena found him on the lawn, he was banging his hand against the lawn, not in pain but in utter anger at his stupidity. It was a moment where he could have gone one of two ways: to do what he did, or to turn off the mower, or unplug it, and then try to unclog it. But, in that moment, that split second ­– that place in time that altered his life forever – he felt that he could do the job just by grabbing at the grass. Did he feel that there was no risk? Or did he think that it was a reasonable risk? Or did he just think the wrong thought? Or did he not think at all? In a breath, in the twist of a wrist, everything changed. And thinking of this, I thought of the brother of a friend, a guy who worked nights and headed home in the early still-dark hours of the morning. He took the same route all the time. But this one morning … did he miscalculate the distance between him and the oncoming truck, or did he not see it, or was he so tired that morning that he couldn’t think straight, or did he think that he could make it? A reasonable risk, or no risk at all? 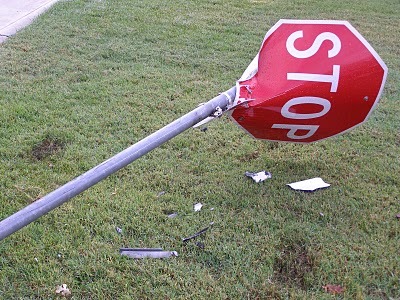 But he pulled away from a stop sign, into the intersection, and he was dead before the other vehicle hit its brakes. What happened in that hair’s breadth of a moment, between intention and oblivion? That place in time. These are extreme examples, and sad ones, and I’m sorry to lay them on you. But we all make these decisions, if decisions are what they are – impulses, maybe, is a better term. We sit at corners in our cars, at stop signs, and sometimes because of cars parked too close to the corner we can’t see oncoming traffic clearly, but we feel, as we edge out a bit, that we can see enough, and that it seems clear to go, and we go – and we, the lucky ones, make it. But it could have gone the other way. We took a gamble – for some reason, we thought it was worth it, or that we were invincible and nothing could happen to us, or that if suddenly a car appeared we could hit the brakes – or they could – and calamity would be avoided. A place, a decision, a time – an action. A result. We go into old buildings and walk onto floors that look like they could never hold us. There is that moment of hesitation, or calculation, or ego, or nothing – and then you step forward. And you are in that place in time, that action of no return. That steep and rocky path, with a long fall below; the electrical wires that could give off a fatal jolt; that rickety ladder you use to reach that ceiling fixture; the slippery roof on a rainy day, and you with a tool in your hand, and a cloud that looks like it could hold lightning … we go ahead and do what sense might tell us to hold off on. That place in time where the action of the present meets the fragility of the future. Time is a place, and this is the most tenuous of locales. That reaching out with the back-of-the-mind awareness that you should keep that hand where it is. Is taking that chance a weakness of the creatures that we are, or is it what makes us human and the dominant life form on the planet? Is it those chances that are what makes a person an artist, and makes nothing into art? By that place in time, by the accumulation of all the little places in time, are we carving out our rightful place in this world, that place that comes only by confronting the chance and taking it. Sometimes you lose your fingers ; sometimes you make it out into traffic unscathed; sometimes you win the battle. Sometimes you disappear. We have hired a neighbor to mow our lawn for us. I will not touch that power mower, no matter how careful and aware I am or sure I will be, with the memory of my uncle in my mind. I am not one for leaps of faith. I will never rule the world by taking a chance. I am resigned to knowing that I will have more fingers than others, but they will have led more vital lives losing a few of theirs, and dwelling more fully in a frighteningly alive placeness that I can’t bring myself to quite enter. Heading north on Route 206 in New Jersey, it is a mixed bag of visual interest. In many ways the road seems older than it is in actuality: somehow it feels quite elderly, say in American Revolutionary War age terms. 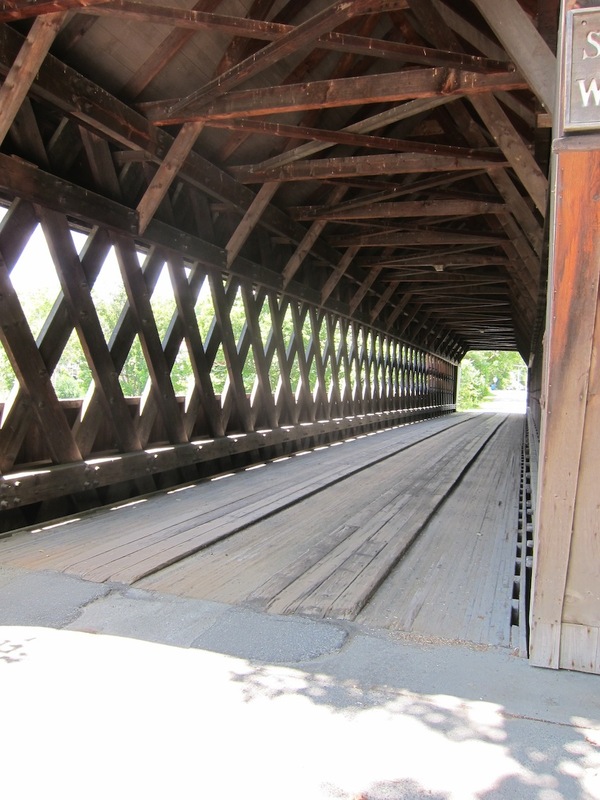 But the road in its entirety is not that old (designated as Route 206 in the 1930s), although fragments of it – it is a stitched together assemblage of other roads – might be, especially around Trenton and Princeton. Overall, Route 206 slashes through New Jersey in a north-south line that almost divides the state laterally. Many sections are rural; probably for not much longer. Route 206’s 130-some miles connect Hammonton, below the Pine Barrens, and Milford, Pa., just shy of the Delaware Water Gap. I find it significant that these two landmark areas, which are fiercely protected, tend to bookend something equally remarkable – something that is possibly equidistant from both termini. 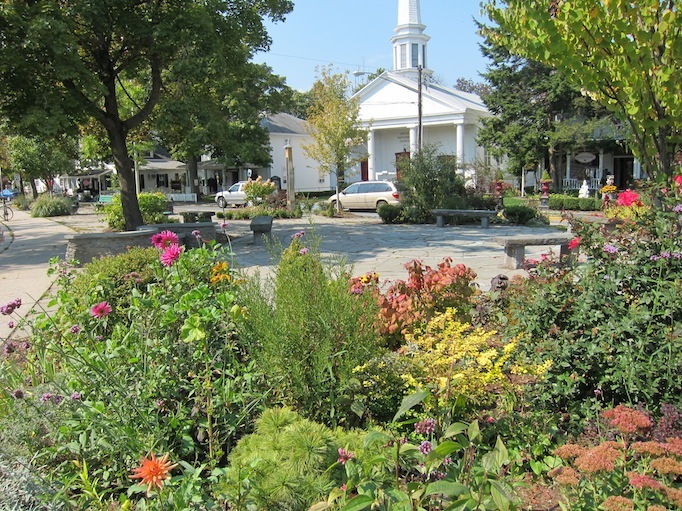 We have travelled Route 206 fairly often, and passing through Princeton is a treat; it is so coiffed and cared for and historically fashionable. The road snakes through the town and campus, then makes its way into recently-developed, once-rural parts. Then, the two-lane highway opens up like a boa constrictor swallowing a large mammal and becomes like every other multilane highway ever conceived. But, wait, we wondered, the first time it caught our eye – what is that exquisite wall bordering the road, that anachronism of perfectly set umber river stones that seems to enclose something? What it surrounds must be something huge, because the masterfully aligned stone wall continues for miles. There are a few breaks in the wall – intentional ones with wrought-iron gates and turrets built of the same stones. What was/is that? 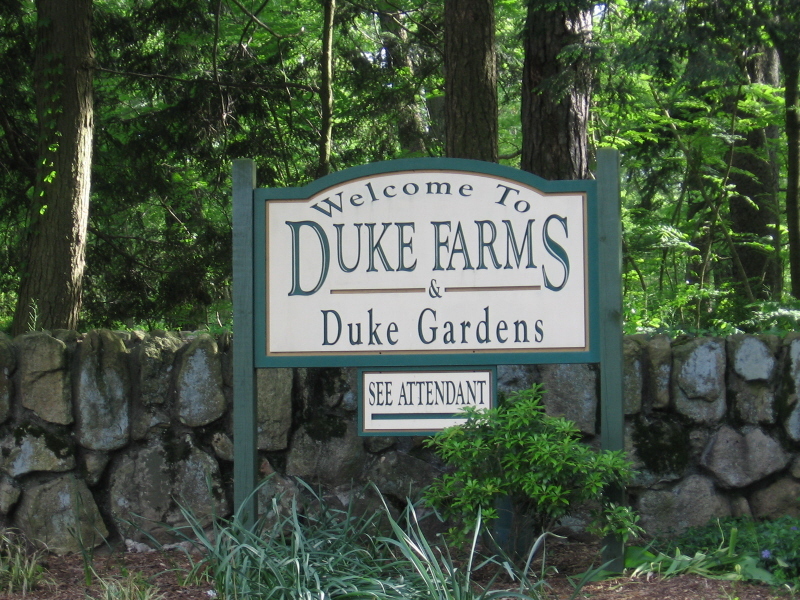 The next time we passed it, going in the opposite direction, I caught a glimpse of a sign – Duke Farms. Hmm. 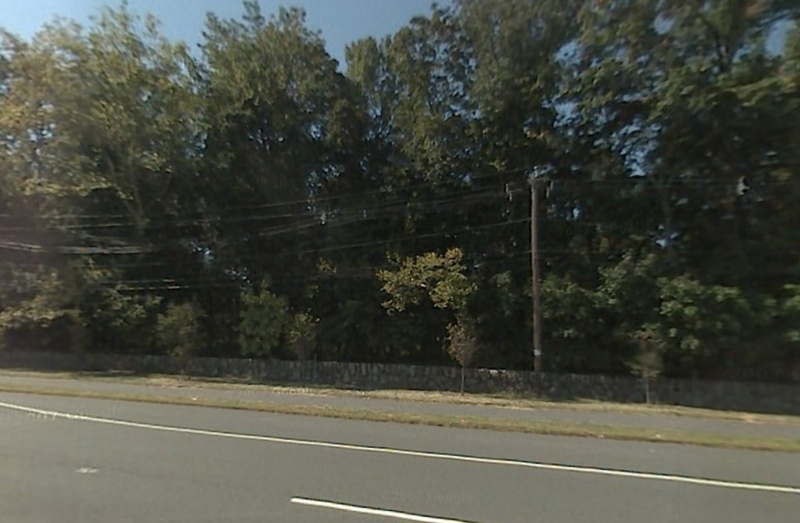 My brain started reeling; we passed a crossroad – Duke Parkway. Duke. Being a PBS watcher, I pondered the only Duke name I know – Doris Duke Charitable Foundation. I wondered. First chance, we looked up the name. My arrow was true: It is the Duke estate, built by Doris’ father, J. B. Duke – tobacco tycoon (American Tobacco Company), early discoverer of hydroelectric (Duke Power Company) and generous benefactor to Trinity College (renamed Duke University). Doris‘ father died young, and Doris transferred her devotion to the homestead with a mostly unbuilt mansion on Route 206 – Duke Farms. Construction on the house stopped after the two-story foundation was laid, and now it is a beautiful ruin. Doris also loved nature and she rebuilt the lavish estate as an environmental model of stewardship; her mission was to protect land, threatened species, habitats and to continue the legacy of the home she loved in a more generous way. Duke Farms is so full of placeness on every level (although it requires turning a blind eye to the tobacco roots – but, hey, America’s beauty is often built on the embarrassing underbelly of robber barons’ give-back). We finally stopped to check it out. Amazing, is all I can say. Take a bazillion dollars and do something meaningful with it: arslocii. Thousands of acres of privately protected land in the midst of over-development. Go to the orientation center in the magnificent Farm Barn. I thought for sure that it was the main house, but no – this was the barn! A 22,000 square foot former horse and dairy barn, it has been greened to the max (LEED platinum) and the cafe even has vegan/vegetarian offerings. It is a kind of cathedral to environmental PC-ness. You can walk trails for 18 miles, you can ride bikes on 12 of them, there is a now-green greenhouse that looks suspiciously like the Palm House, in Kew Gardens. If you want to see how significant this walled paradise is, look at the photograph in front of the Farm Barn that is mounted on a stand. 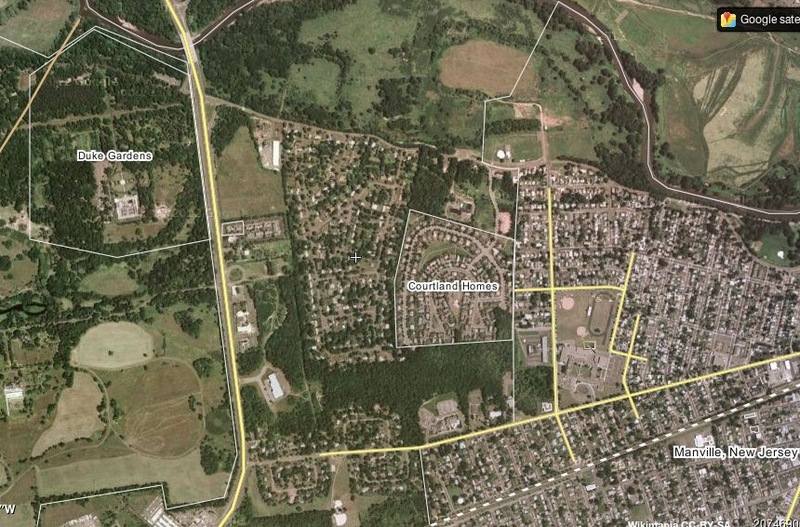 It is an aerial view of Duke Farms with its surrounds: wall-to-wall dense housing that, at first glance, looks like cotton fields beyond the open space. Compare and contrast. Beauty and the beast. 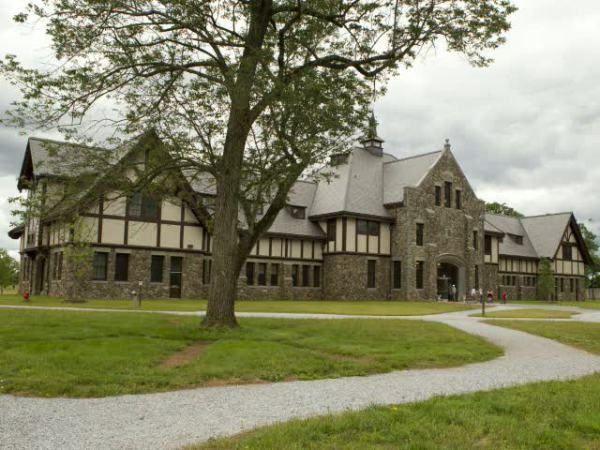 What is also mind-boggling is that Duke Farms has been open to the public for only one year. It is, in many ways, a surprising treasure of placeness in the sometimes placeless sprawl of New Jersey lurking outside its lovely wall. I must have been 3 or 4 when it happened. I still have a memory of the event that seems to have imprinted on my life. My parents were away, maybe for their first trip since I was born, my grandmother was staying with us and that was great – but I was so eager to see my mom and dad. The casement windows were higher than my sightline, so I climbed up on a chair to catch a glimpse of their impending arrival. The seat wasn’t quite enough of a boost and I raised myself to the arm, balancing on its narrow edge, and leaned over the radiator toward the now attainable view – a bird’s-eye perspective of the main entrance to our apartment building. I would be able to witness their grand return. As the chair tipped, my face hit the sharp edge of the cast-iron radiator, blood gushed from my cheekbone. I still wear the scar as well as the memory. This was my first intimate knowledge of radiators. As an adult and about eight years after buying our house, we decided to switch from a hot air system to hot water. We went with baseboard radiators – something I couldn’t fall on, maybe. I assisted, as much as I was able, with the installation, all the while uncertain about my choice and still harboring a strong attachment to the old cast-iron maidens; hey, we were blood brothers. Our heating contractor was chosen because of his enlightened attitudes, and this led him to hiring me later as his helper on other heating jobs. For three years, I worked on every type of heating system devised – some by geniuses, some by charlatans. 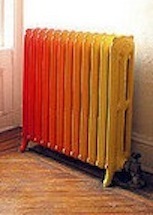 There were many cast-iron radiators that we would either install or de-install. My sense was that the smarter people stayed with the old stuff. Currently, I am in the process of changing residences. Once again, the new house will be altered from a heated-air system to hot water. 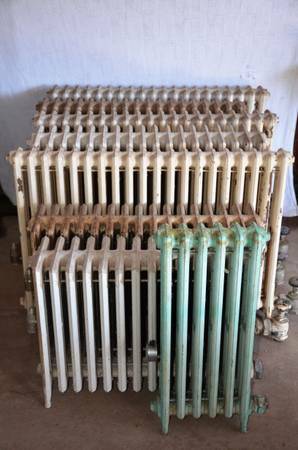 And now I am caught in a personal journey into radiator hell in the Underworld of craigslist. It seems to be my destiny. The first circle of suffering is the one where people question your sanity about going in the opposite direction from the flow. I think we are just talking about American flow here, because in Europe (where they have been heating long before we were born), Canada and Australia – central heating still means hot water. Despite that, America is yanking out water systems like there is no tomorrow – and maybe there isn’t. But I was, miraculously somehow, able to make it out of Limbo alive and with my imperative intact. Although some may argue that this decision included the second circle, Lust, because they think that my sense of reason is impaired by going this route and pursuing radiators. 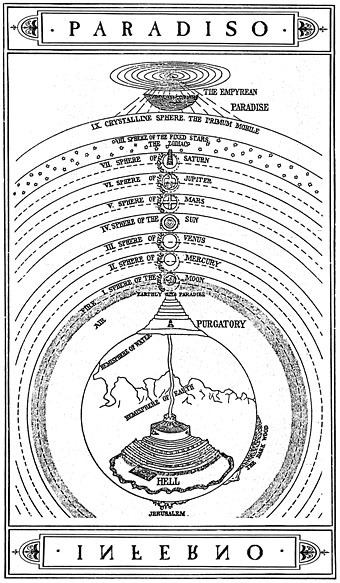 Another circle of suffering is the Dante-imagined cold slush of Gluttony; my goal is to avoid that sort of chilly hell – in my old age, especially. Hell is supposed to be plenty warm, as I intend to be with my radiant units. Within craigslist, I relentlessly search the listings for radiators: this is where Greed, Heresy, Anger, Fraud and, potentially, Violence come into play all at once in varying amounts. You know what I’m talking about. My quest is in progress. Possibly nine of the fourteen radiators needed have been located. If I can pull this off, it will be the best kind of placeness yet – the one that keeps me warm as climate change makes comfort more challenging, and my own circulation slows to an eventual stop. And, mostly, it will be a scaling of Purgatory, and a kind of closure to my life with radiators – scar and all. Right up front, Woodstockers will tell you that the famed rock concert didn’t happen there. Of course, this will not stop them from trying to sell you an “authentic” souvenir commemorating those three muddy, giddy, iconic and inimitable days of peace and music. And why should it? The show might have taken place in Bethel, but it got its name from the town that spawned the idea for it and lent its considerable good vibes to the proceedings – good vibes that exist there to this day, in much the same way that they did then. Manhattanites come, old folkies go, but, to an extent that is almost miraculous, Woodstock remains Woodstock. The concert happened nearly 70 miles away and 45 years ago, but the echoes reverberate still off Overlook Mountain. Come into town (we were heading in from Woodstock, Vermont, via Massachusetts), along Route 212 or down 375 (what is soon to be known officially as the Levon Helm Memorial Boulevard), take a gander at the mountain range all around, and then notice primarily what is not in the village, the central core of the town: except for a couple of national-brand pharmacies, there is no big-box store, no chain restaurant, no big-name shop – this is by design. Woodstock wants none of that, thank you. There are more Buddhist prayer flags than American flags (not that it is an unpatriotic place, it’s just that it has its priorities), and more ponytails per capita than most other towns – and that’s just on the men. 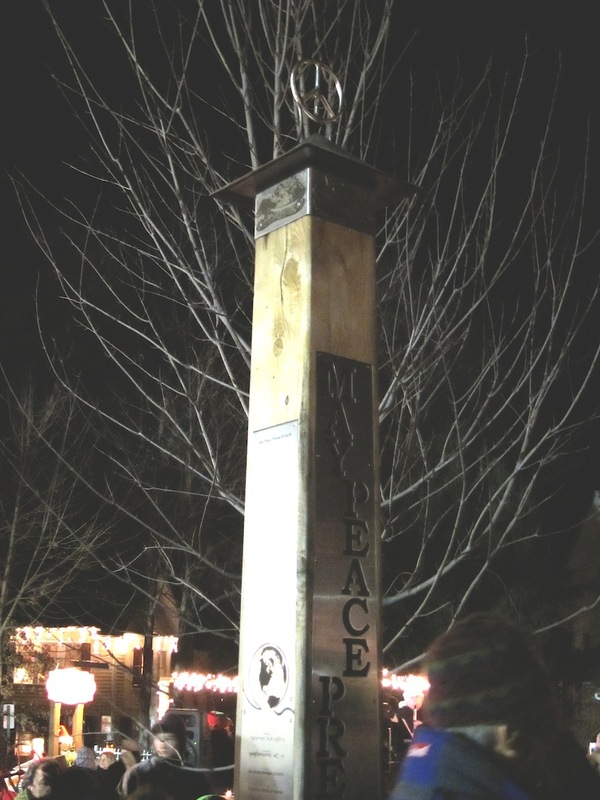 Where other village greens in other towns display old cannons or heroic statuary, Woodstock, N.Y., has a Peace Pole. It also has, on warm-weather Sundays, a drum circle, complete with volunteer dancers swaying in abandon, and a bizarre Father Woodstock – dressed like a sorcerer by way of Sergeant Pepper and Doug Henning – giving peace signs to passing motorists. It’s the boutique-y shops, oddball businesses and natural beauty that attract weekend tourists to this oasis in the Catskills just two hours north of New York City, but what draws artists and writers and musicians to make Woodstock their home, even if they’re just weekenders, is that it is a place that, since the early 20th century, has been a gathering place for the creative of word and deed and imagination. The town calls itself the Colony of the Arts; its town crest hasn’t the usual symbols of government on it, but, rather, representations of painting, theater, music and writing. It is a town with a laissez-faire attitude toward outsiders and art-makers – it is known as being a place where you don’t have to explain yourself or your oddities, and a place where those attributes might even be celebrated. There is even a cemetery dedicated to artists. 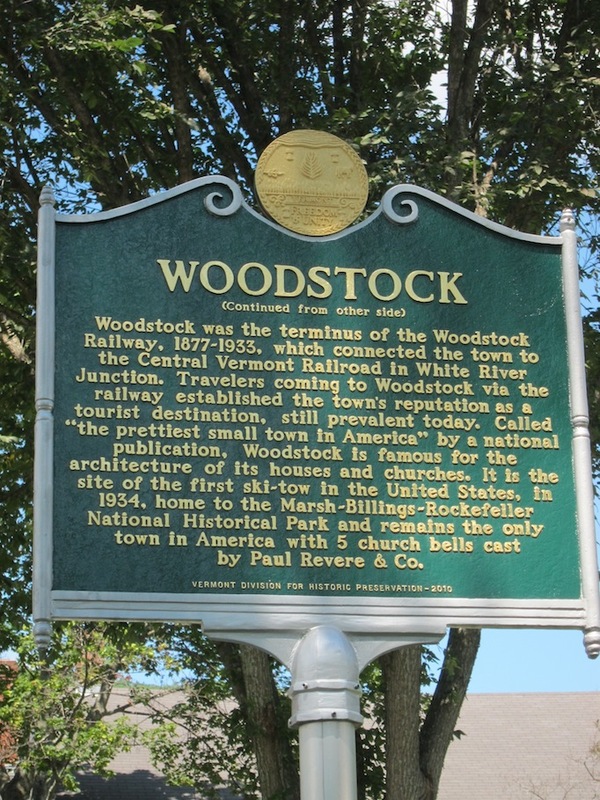 Folks from Milton Avery to Joan Snyder, Bob Dylan to Steve Earle, The Band to Donald Fagen, Helen Hayes to Uma Thurman have all called Woodstock home at one time or another. Even David Bowie’s around there somewhere. 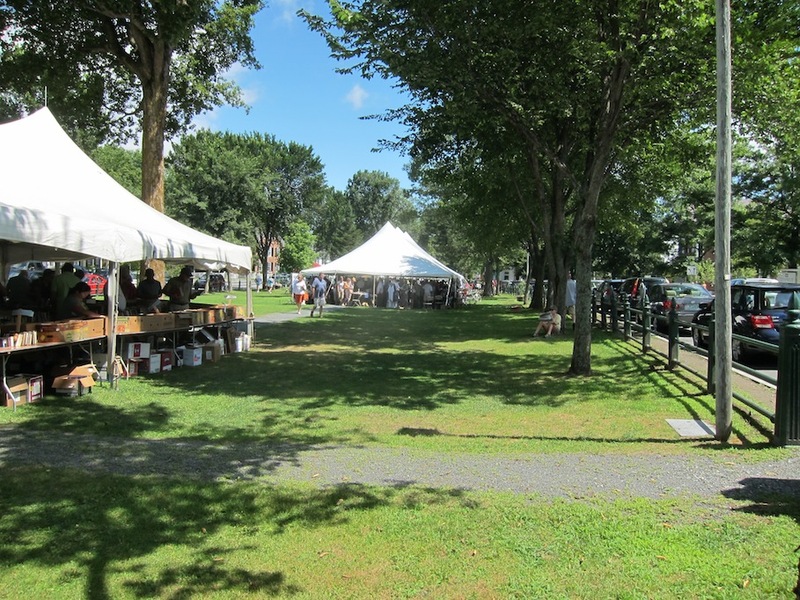 These days, real estate is a bit pricey, and younger folks are taking their artistic baby steps in outlying smaller towns and in the nearby city of Kingston, but even they know that other places are for paying your dues – Woodstock is the reward. We began our Woodstocks wanderings with the intriguing though half-baked concept of touching base with as many towns of a similar name as possible, and seeing if there were any commonalities. There weren’t many – shared names, even if from identical origins, don’t mean that there are any other similarities. They weren’t separated at birth; they don’t have shared DNA. 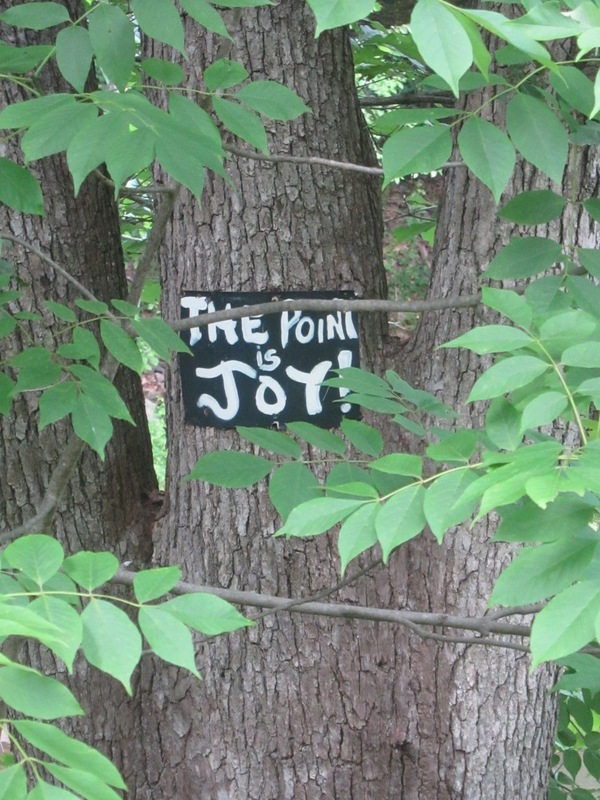 Woodstock, Conn. and Woodstock, N.Y., might just as well be in different countries. What they do share, though, is a sense of what they are, a solidity of values and a refuge from urban woes. They are all relatively small outposts, and they have lives beyond the shadows of behemoth cities. They all have nice people. Maybe what they share is a kind of goodness, a spot of safety and the sense that if all the rest of the world starts slipping down that drain with a loud sucking sound, they will not be going that way, or if they are, they will be last. Here’s a free-association test: Say “Woodstock,” and people with money will reply “Vermont,” while those with ‘60s cred will point to the music fest in New York. 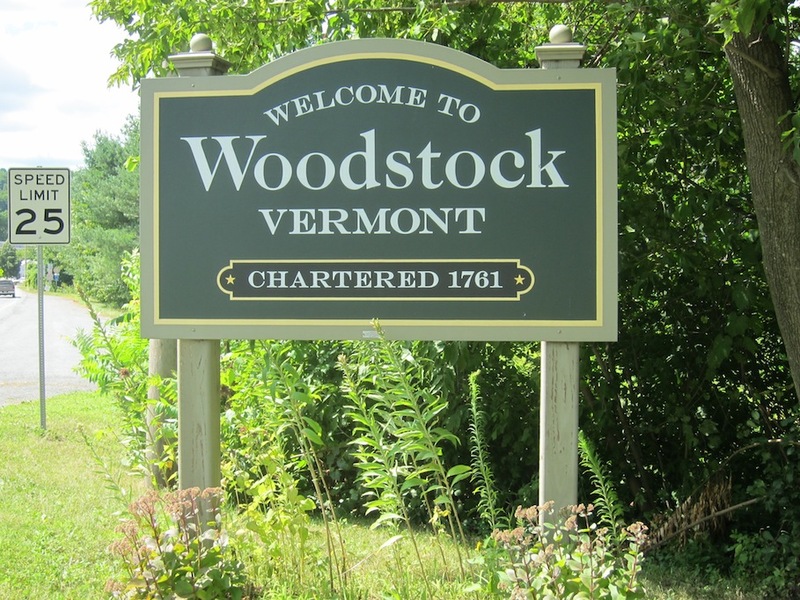 Of the Woodstocks we’ve visited so far on our thematic trek – first in Connecticut, then New Hampshire – Woodstock, Vermont, is the one that sits at the grownups’ table. The village was invented, it seems, so that the word “picturesque” would have something to refer to, and it is so formally self-aware of this and of its tourist-attracting saleable past that it has a historical marker with so much written on it, it has to continue on the back side. 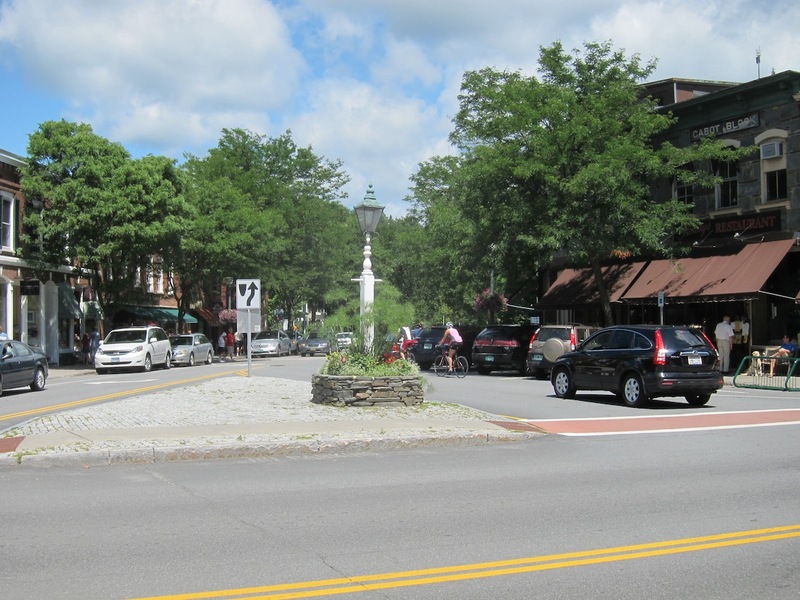 It is the village of a mere 900 or so residents that we speak of here; it sits within the town of Woodstock, which contains about four times that population and a South Woodstock, too. As we drive into the village core, park and walk around, in the summer sun (although ski season is among its chief raisons d’etre), the place seems to be gleaming white (in more ways than one), with spotless sidewalks, many old and idiosyncratic storefronts, pretty picket-fenced houses, a stately and gorgeous (inside and out) public library … god, there’s even a covered bridge, and a big village green where, when we visited, a huge annual book sale was in full swing. Wholesome values, in aspic. You want New England, this place is perfectly lousy with it. And that’s the drawback, as we see it, from a placeness, arslocii perspective – it is too perfect, and, though a creature of centuries of urban evolution, seemingly too much a creation of intelligent design. Some of that has to do, we’re sure, with the nature of tourist allure – presenting visitors with what they expect to see – and some of it with Disney-ish Main Street-ification. At times, we thought that the only things missing were crowd-mingling reenactors dressed as Paul Revere and an easel-toting Norman Rockwell. There is money here, and much of it came from Rockefeller wallets, and while that family has made startlingly wonderful efforts to preserve art and land, their participation often leans to the development of a more studied, more fashioned, more cleaned-up/dressed-up artificiality – a shaping more than a tending, and a slight soullessness in its immaculate artistry. 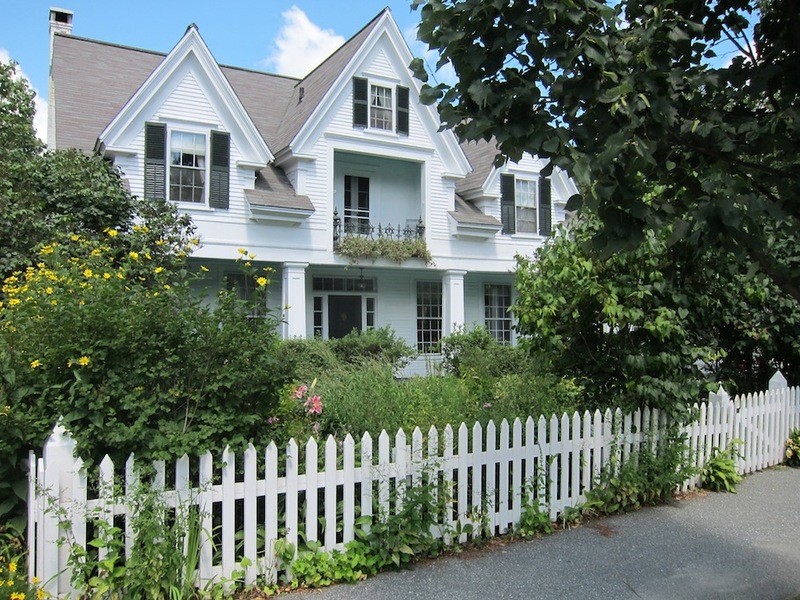 The feel of that stewardship circulates down Woodstock’s quaint streets and byways. Don’t get us wrong: It is an attractive village with surprising amenities and photo-worthy views, and, if you find yourself in the neighborhood you owe yourself a stroll. But, when you are there, thereness might not be your walking companion.